As a pure science student at high school Leone Naivalu was focused in becoming a medical doctor. He fell short in his marks but he pursued on regardless as his mother inspired him that whatever difficult situations he may encounter to always trust in the Lord. “My late mother (Meri Naivalu) was my inspiration; she always convincingly said I should let the Lord guide me through always,” Mr Naivalu said. 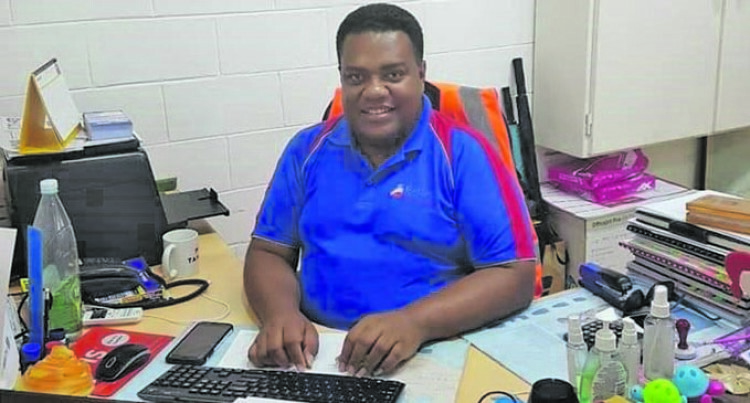 Mr Naivalu, 33, originally from Nasilisili in the Yasawas is Kenua Shippings manager; he is the man behind the operations and documentation of cruise liners that berth into any port in Fiji. “I make sure that those cruise ship in ports have their arrival notices submitted. “I ensure that berths/anchorage are clear and communicating to the ship if there are any issues of concern prior to arrival,” he said. “Liaising and meeting with Government regulatory departments/Embassies/High commissions and importantly ensuring that cruise ships follow through with Maritime and Boarder security regulations on arrival and while also sailing within Fiji waters. For school he has attended Mount Saint Marys Primary School, Saint John Bosco and Dilkusha Boys from Years Five to Eight. He attended Nadi College from Years Nine to 13. His father was airport manager; his being transferred around Fiji saw Mr Naivalu attending three schools for his primary education. Both his older sister and brother are married with children. He attended Fiji National University in 2010 and graduated with a Diploma in Business Management. He is currently pursuing his degree in Management and Human Resources. He has worked for so many companies which include the Muffin Shack in Namaka, Nadi from 2008 till 2010 as a driver and administration clerk then to Williams and Gosling as an accounts and administration officer from 2010 to 2012 after his graduation, then he joined his sales and marketing department as a sales executive from 2012 to 2016. In 2016 he was given opportunity to move across to their subsidiary company Transam Fiji Limited to join Kenua Fiji as the cruise Liaison Officer. “My dad is retired and my mom passed away in 2012, this was the most difficult time of my life, which had set backs in pursuing my degree at Fiji National University. “I am indeed grateful to my family and friends for being there for me which greatly assisted in putting me back on track. “My childhood dream was to become a doctor that’s why opted to take pure science in secondary school. “I didn’t actually meet the marks required to get into medical school, even though there were alternatives. Apart from being a manager in cruise industry he was also involved in community works. He was part of the Nadi Bula Festival Trust from 2010 to 2016 after he was appointed President of the Trust and worked closely with the committee in ensuring that key objectives were met.